When Sugaray belts out a song, you not only hear it, you feel it. The excitement in the room is palpable when he takes to the stage; his dynamic voice is large just like the man and stands comparison with all-time greats of soul, blues and old-school R&B such as Solomon Burke, Muddy Waters, Otis Redding and Teddy Pendergrass. After years of tirelessly grafting, it seems Sugaray’s efforts are starting to pay off, as he was nominated this year for the BB King Entertainer award at the 38thBlues Music Awards and nominated for Contemporary Blues Male Artist.Texas-born Sugaray began his musical career at the tender age of seven, singing and playing drums in church, and his gospel influences definitely shine through in his music. The soulful gravel in his voice hints at his first-hand experience with hardship, and a childhood marked by poverty and loss. “I remember a sad game I used to play with my brothers, a competition that determined who was skinniest by counting the number of belt holes left unused,”recalls Sugaray.His mother struggled to raise three boys alone while battling cancer. When she died, it was a kind of relief. “She suffered and we suffered,”Rayford says. “Then, we moved in with my grandmother and our lives were a lot better. We ate every day and we were in church every day, which I loved. I grew up in gospel and soul.”His switch to contemporary music began about 15 years ago in the San Diego area, where he sang lead vocals with a R&B/funk groupcalled Urban Gypsy’s. With this band, he had the privilege of sharing the stage with such notable artists as the Average White Band, actor-musician Dennis Quaid, Joe Louis Walker, Kal David, Super Diamond & Venice, to name a few.After dabbling in blues,Sugaray realized that the blues was where his heart and soul belonged. After some soul searching, he left the Urban Gypsy’s and became lead vocalist for Aunt Kizzy’z Boyz, a Temecula area blues band. Shortly after joining the band in 2004, they released their first CD, ‘Trunk Full of Bluez.’ This band was hungry and did over 200 gigs a year over the next few years, as their popularity rose exponentially. In 2006, Aunt Kizzy’z Boyz represented San Diego (Blues Lovers United San Diego) in Memphis, Tennesseeat the International Blues Challenge (IBC), and brought home the second place prize. The band began playing higher profile gigs and in 2007 released their 2nd CD ‘It’s Tight Like That.’ In 2008, the Boyz won the LAMN Jam Grand Slam Urban Artist of the Year title by a landslide, beating out hundreds of competitors. The band was offered a distribution deal on the spot by RBC Records. After moving to Los Angeles several years ago, Sugaray was asked to host a blues jam at Cozy’s in Sherman Oaks. It’s through this venue that Sugaray met and played with innumerable world-class musicians. Suga’s desire to explore and expand his musical vision has been nourished by these musicians. His solo career has flourished in LA, and he also travels the world singing with other bands like Igor Prado Band, “Big Pete” van der Pluijm, Sax Gordon and several other groups.He has done studio vocals on numerous projects, such as the theme for ‘Judge Joe Brown,’ the movie ‘Trailer City Lights,’ a couple of songs on ‘Person of Interest’ and many others.In May 2012, he made his stage debut starring in the Tony award-winning play‘Ain’t Nuthin’ But The Blues’ at the Portland Centre Stage in Portland Oregon. He joined members of the New York Broadway cast in the role previously played by the late Ron Taylor. In its six-week run, every show ended with a standing ovation. 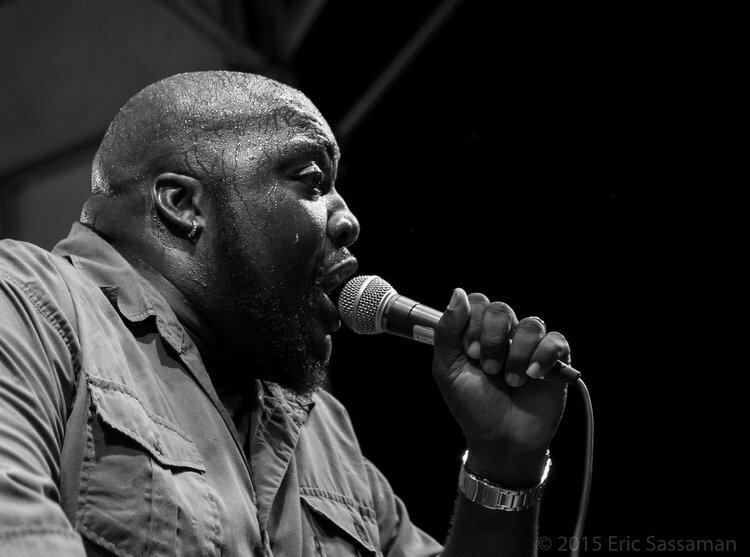 He also starred with Felicia Fields and Chic Streetman in the play’Low Down Dirty Blues,’ which ran in Milwaukee and Cincinnati in 2015.With the help of Blind Faith Records, Sugaray is focused on presenting his latest project, ‘The World That We Live In,’ a collection of ten original songsand soul debut album, to the world. It carries the gift of universal appeal that towers above tastes and trends, and it’s an album destined to become an instant classic.